Whoap is one of the 'grassy lumps' that sit around the Calder valley in the western Lake District, and is one of the more isolated fells, sitting towards the head of the almost empty Calder valley and hidden behind the fells that line Ennerdale Water. Its location means that the fell is rarely seen from any great distance, with higher ground to the north (Crag Fell), the south (Lank Rigg) and the east (Ennerdale Fell and the flanks of Caw Fell). The fell is most impressive when seen from the west, especially from the valley of Whoap Beck, which runs below the fell's steepest slopes. The fell doesn't provide great views of the surrounding mountains, most of which are seen from their less interesting side. The most impressive of the nearby fells from this angle is Caw Fell, with the crags above Bleaberry Gill seen to good effect. The valley views are better, with the fell sitting at the head of the valley of Whoap Beck and part of the upper Calder, while to the south we look out over Worm Gill and the vast empty area north of Skalderskew farm. Whoap is a gently sloping fell, and so can be climbed from just about any direction (apart from the steep south-western slopes). The main difficulty is thus finding a way to the isolated fell rather than a route up. The easiest routes in both start from the Cold Fell road in the west. 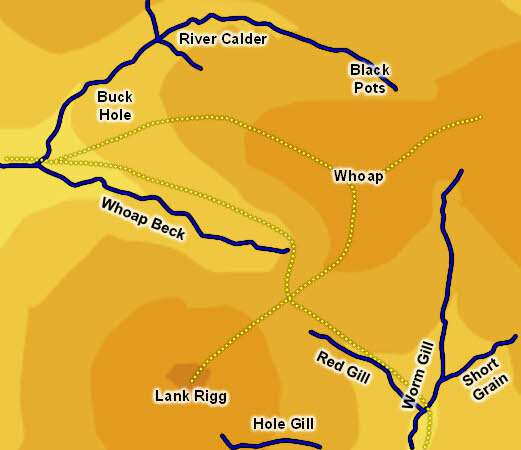 The northern route follows an old mine track that begins at Scaly Moss, runs north of Blakeley, crosses a Forestry track near Kinney How, then runs along Heckbarley, Grike and Crag Fell. Just above Black Pots a track drops down to cross the valley, then climbs up alongside a stone wall heading for Caw Fell. About half way up the first climb we come level with the pass to Whoap - turn right head and head west across a level area to the summit. The southern route leaves the road at the sharp bend above Whorl Gill. Follow a track that runs east to the River Calder. At the river cross Stinking Gill and continue on east. This brings us to the western corner of Whoap, and a choice of routes - either head straight up the western flanks of the fell or follow the path that runs just above Whoap Beck heading for the col between Whoap and Lank Rigg. At the pass turn left and head up to the summit. Plenty of other routes are also possible, but most are perhaps longer than is really worthwhile. We don't have an ascent of Whoap but it can easily be visited from our walk up Lank Rigg. The summit of Whoap is a fairly flat grassy plateau. The River Calder rises at Black Pots, north of the fell (between Whoap and Crag Fell). The river flows west then curves to the south, forming the northern and western flanks of the fell. Whoap Beck rises under the south-west slopes of the fell and flows west to join the Calder just below Buck Hole. The combined waters then flow west for just under a mile before turning south to begin the Calder's run to the sea. To the south Red Gill forms the boundary between Whoap and Lank Rigg, running east. The eastern boundary, between Whoap and Caw Fell, is formed by a nameless beck that flows south, joining Red Gill and several other streams to form Worm Gill.